I have seen several ways but I have found one I really like on my own. I came across my beta fish food bottle and it seemed like the perfect size I wanted, so I emptied it out. I thought about newspaper but I had just received 3 new phone books, so I had 6 total. I decided to use the white pages of the old ones and they worked perfectly. I start by folding one page in half. On the folded side (to make it neater) I roll the paper around the bottle. I fold the rough end down and put the cap on the bottom. That is why I liked using this bottle, the cap fits on both ends. Then I pull the bottle free, leaving the cap on. 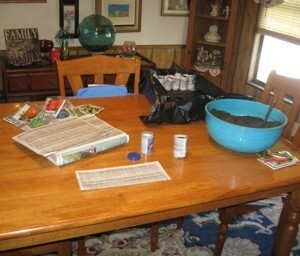 Fill your paper container with dirt then take off the cap and your paper container is ready for your seeds. When you water, you can either water from the bottom. Put them in something waterproof, of course. Or you can spray them from the top. When it comes time to plant them, make sure you bury it with all the paper in the ground. I have tried these pots in the past, but they get moldy. Any suggestions? Hey Laura we are neighbors I live here in Silver Springs but out in the Forest. 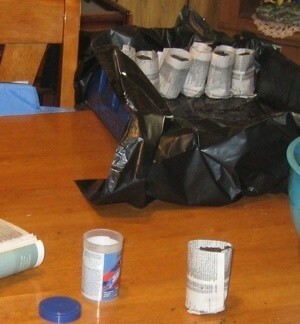 I have made the newspaper pots also my question to you was how are you stopping the squirrels from getting the seeds. Phone book pages are the ideal thing for these paper pots. 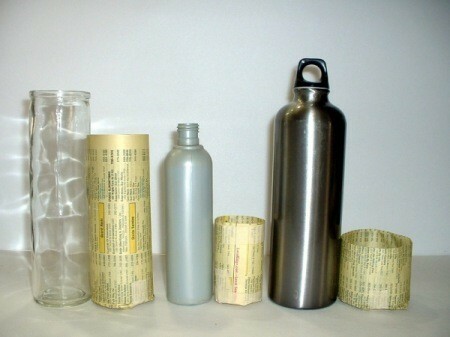 Without any cutting, you can make several different pot sizes. I make several hundred of these every year. I use these indoors to start seed, so I don't have a problem with squirrels. Mold growing on the pots is usually due to poor air circulation and keeping the pots too wet. If I see mold, I cut back on the water and use a small fan to increase air circulation.